in bavaria, sunrise and sunset cast the most divine shadows and light over the alps. each thrilling combination is thrillier than the last. i was zoomed in way too much on my iphone in the photo above, but even the grainy outcome doesn’t detract from those colors, that light. i was in heaven out on the balcony in the evenings writing in my travel journal and making sketches. oh the utter delight of slow travel. one day we lingered over lunch at this old inn on the banks of the kochelsee about 30 minutes north of wallgau. a rosy pink sunset by the isar river. i luxuriated in the peace and quiet. the older i get, the more distracting and upsetting i find the the noise of city living. as i overheard a man say once, “i love people i just don’t want to see or hear them.” or busses, cars, leaf blowers, barking dogs, hammering, welding, firecrackers. wind water rain birds bees purring maybe a few soft voices from far away once in awhile so you know you aren’t the last homo sapien on the planet. one reason we chose this particular region of bavaria is for the storybook lüftlmalereien or traditional bavarian frescoes which are painted on many of the facades of both houses and public buildings. the paintings have been an integral part of village life in this part of bavaria for centuries. they tell stories of traditional life, customs, and deeply held religious beliefs. wallgau, the village where we stayed had the lüftlmalereien everywhere you looked. one building after another had incredible alpine scenes adorning every surface. 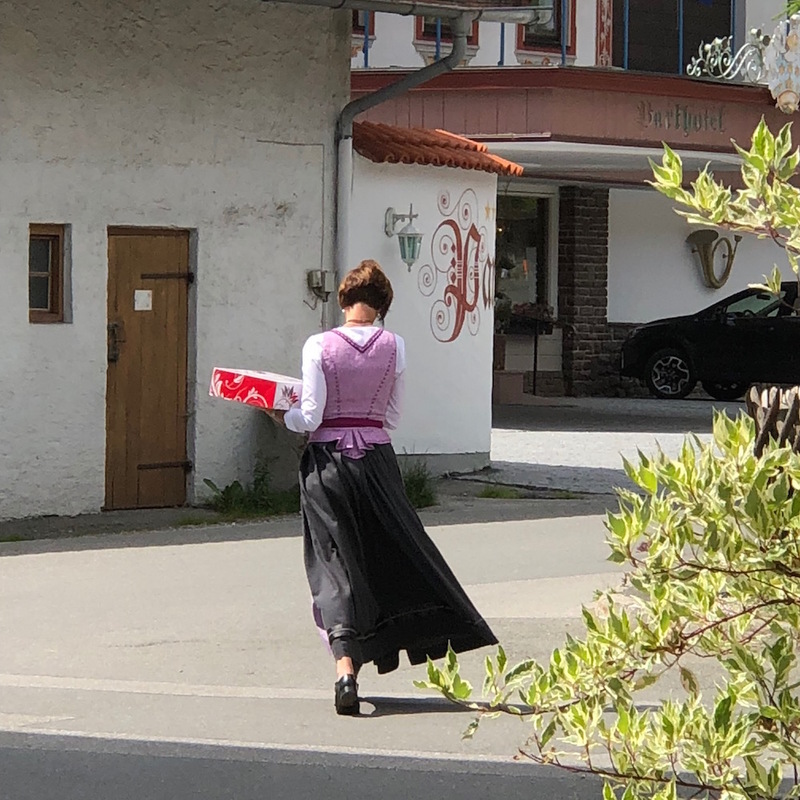 this is an old tradition that is maintained to this day by artists who continue painting these fairytale-like scenes on the buildings of their towns in this part of bavaria. they were literally everywhere we went. it was such a pleasure to walk by and study them up close. as if that weren’t enough, most of the buildings had hand-painted gothic blackletter signs. have i mentioned the mailboxes? everyday is a happy mail day if it comes wrapped in this kind of package. there is a special thrill upon seeing another man or woman in traditional dress. oh the carved wooden balconies and windowboxes! i’m afraid i’ve run out of superlatives. if you want to feel like you’re inside the pages of a storybook go stay in a small village in bavaria. there aren’t hoards of tourists and you might feel like you have the whole place to yourself. of course there WERE tourists, but since the ones we encountered seemed to be speaking german we felt like we’d tumbled down a rabbit hole of sorts. a charming unhurried world in which to eat, drink, and explore. oh the wonder of travel! every bakery & cafe had dozens of assorted cakes. my favs were the ones featuring berries! carol loved the ones with poppyseeds. we couldn’t stop staring at the alps. they were the stunning backdrop for every village we visited. for once the coffee was perfect for me and not too strong. although back home i’m in the habit of black coffee, i indulged in light frothy cappuccinos in bavaria. nice and weak just the way i like ’em! how about a plate of kaiserschmarren? a light, caramelized pancake made from a sweet batter using flour, eggs, sugar, salt, and milk, baked in buttah. oyvey! oh how we made use of our balcony table! most days we had our breakfast & dinner right here while watching the light show in the surrounding mountains. i always had my binocs with me so i could spy on people walking on the nearby trails. after awhile sister just ignored my running commentary. Hi, Mary Ann – I was watching Ina Garten yesterday on the Food Network and she visited Wolfgang Puck at his restaurant where he made for her his favorite childhood dessert, . . . (drumroll) KAISERSCHMARREN. He translated it as “a little bit of nothing for the emperor” because it is so light and airy. Here is the link to the recipe and episode if you are interested in recreating it at home: https://www.foodnetwork.com/shows/barefoot-contessa-back-to-basics/videos/the-contessa-travels. Love, love, love your travel journals! Honestly, i just love reading any dispatch you send out. I retired at the end of this school year. So far it’s been rather like any other summer. However, the closer to the start of school the more excited I get knowing I don’t have to go back. I’m sure the reality will hit when my teacher friends are back at work and I’m getting to work on my projects here at home. I’m thinking I will feel like a kid playing hooky! oh holy hellz bellz that sounds DIVINE missus brooks ann miller. how i love your brand spanking new life unfolding! Aaaa-maaa-ziinngg photos, Mary Ann! Thank you for sharing your trip and your travel journal with us. I will be putting this trip on my bucket list. Those mountains!!!!! I love reading about your adventures, seeing your journal and photos. thanks for you wonderful way of writing and your humor. I do hope we meet some day….or better yet, you invite me on one of your adventures! thanks Mary Ann!!!! love your journals and photos. what a beautiful place. I am so glad you posted a photo of the kaiserschmarren! I don’t think I got a picture because I got so excited when I saw it and immediately dove in. It goes on my list of favorite foods in Bavaria for sure! I jyust love your posts and often think how lucky you are to have your sisters that travel with you…I see that Carol has the same travel bug as you and shares art with you..You are so lucky…Thanks for sharing your travels, your beautiful photos that capture the environment and cultures of your travels and thank your for journals and the painting you do….Also thank you for yours thoughtful remarks. hi susan – i do feel lucky to have 2 sisters that are fine travel partners. yes indeedy! Fantastic, fabulous, wonderful, amazing, gorgeous…. The superlatives don’t do the scenery & your pix justice. LoveLoveLove! Amazingggg!!!! What a fantastic country! I love how you share your wonderful travel adventures with us. Thank you so much. howdy meredith, germany is a place i know i will return to – it is indeed fantastic. I so look forward to receiving and reading your Dispatches. I like the photos and sketches together! Love to see and read about the adventures of the Moss Sisters! Another fabulous trip to somewhere new and a journal to tell the story along with memory tidbits. Simply Beautiful! BTW just picked up the August issue of WATERCOLOR MAGAZINE, with your article about travel journals and documenting a trip! thanks so much for sharing your photos and sketches…We stayed in PartenKircken (sp) just below the Zugsp. hi julie, i hope to have good memories like yours in 30 years!